Maui Vista One Of Two Pool Areas. Maui's South Shore features striking beaches, world-class tennis and golf facilities, fine dining, luxury shopping, and arguably the best weather on Maui. 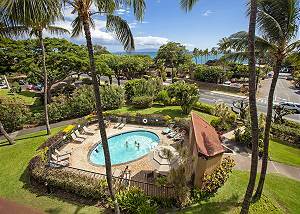 You will find the beautiful Maui Vista condo rental complex on Maui's stunning South Shore. 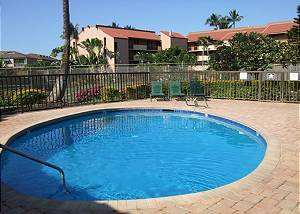 This Hawaii rental property features one and two bedroom condos that are both fully equipped and thoughtfully appointed for your comfort and enjoyment! Each of the resort's three buildings has their own tennis courts, pool, and barbecue area ensuring enough facilities for all. Return visitors are common at our affordable vacation rentals. One of the reasons we see such a return rate is because although it's affordable, it is far from cheap on complex features. Take a long beach walk on the edge of the Pacific Ocean with your toes deep in the soft white sand to start your morning off or have breakfast on your private lanai! Maui Vista is paradise found! If you are looking for fine dining and shopping, both can be found in Kihei. Neighboring Wailea has luxury shopping and dining at the Shops at Wailea as well. This fine Hawaii vacation rental property is located across from the gorgeous Kamaole Beach as well as within walking distance to Kalama Beach Park. These beautiful beaches have lifeguards, restrooms, showers and picnic areas. If you are looking to learn how to surf or hone your abilities, surf's up at Kalama park! This excellent beginner surf break is also a great spot to watch the sunset with the surfers complimenting the breathtaking colors of our Hawaiian sunsets. Kihei is the epicenter for many beach activities! From stand-up paddle boarding to amazing reefs for snorkeling, Kihei has it all. 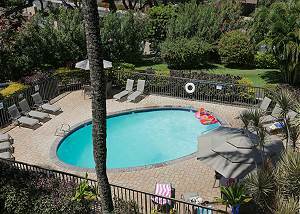 If you are looking for affordable vacation rental value on Maui, it can be found at the Maui Vista. Incredible location and excellent amenities make this resort a top choice on Maui for a vacation rental. Come get lost at Maui Vista! After this trip, every time you think Maui, you will think Maui Vista.